Yet this “ire” is what’s built into our DNA from pre-school: Sit quietly on the rug. Sit quietly in your row. Listen. Raise your hand. Answer the question. Have your answer evaluated. Maybe your teacher says, “That’s right!” You feel good; you’ve got it (whatever it is). Maybe the teacher says, You’re getting it, who can help?” You feel sort of good, but sort of frustrated. What is the secret code? Maybe the teacher says, “Sorry, you’re wrong.” But probably it comes out as, “Hmm, let’s see who else has an answer.” Maybe you don’t raise your hand the next time. Maybe your friend who sits in the back of the room never does. It’s a huge risk to be wrong in front of your peers. It’s also a risk to step into academic discourse. Can you remember the first time you used the word hegemony? Or pedagogy? In The Dialogic Imagination, Bakhtin conceives language as “entangled, shot through with shared thoughts, points of view, alien value judgments and accents.” To speak is to enter a site of conflict, using language that “exists in other people’s mouths, in other people’s contexts, serving other people’s intentions.” From this point, Bakhtin argues, “one must take the word, and make it one’s own.” I buy it. It’s through dialogue that we gain the space to try out academic language and make it our own. It’s how people begin to feel that they belong in academia. But do we give students that space? And when we don’t, at what cost? A senior recently told me that he unwittingly plagiarized directly from the reading on his homework because he was “afraid to be wrong” in his response. Others who quote excessively have said similar things: The writer is the expert. The teacher is the expert. I am not. The best I can do is guess correctly what the teacher thinks. How do we get students to “take the word” and make it their own? And why is it so hard to make this happen? Student resistance. Ironically, it is often the higher achieving students (used to getting the “right” answer) who rebel against open-ended discussion, made anxious by ambiguities to be defined and explored through evidence, logic, and persuasion. Some of these students may also dominate the conversation, unwittingly silencing others who may be waiting for the right time to speak. (A lot of material to deliver) + (a short time in which to do so) = lecture. Perhaps you pepper your lecture with Q&A to make it interactive. Q&A = I-R-E. Classrooms are designed for management. 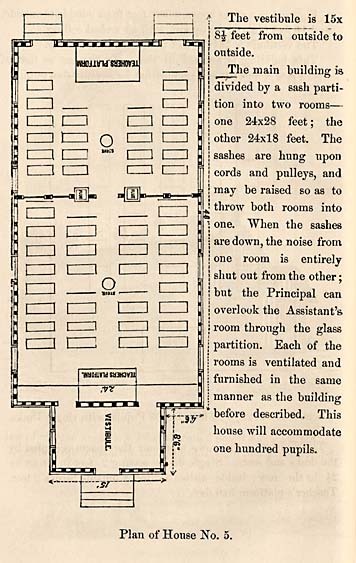 There’s a reason that classroom blueprints going back over a century (like this one from 1869) were designed to accommodate rows of students rather than circles or u-shapes. It’s easier to keep order when the only face students see—and the only voice they hear—is the teacher’s. Yet the omniscient teacher sees and hears all. In a university, we don’t have many management issues, yet our classroom layout often replicates 19th century designs (Yes, I’m looking at you, Bell Tower 1302). Here are a few ideas for tackling these three challenges. If you have monopolizers (the same handful of students always chiming in), try discussion rounds. Don’t signal this ahead of time, but after your usual suspects have weighed in, signal the end of Round 1. If you spoke in Round 1, you listen in Round 2. I’ve gone as deep as round 4, thinking that for sure nobody would talk at all. Surprise—when they didn’t have competition, even my quieter students had things to say. Not everyone will speak in large groups, but that’s okay—people learn a great deal by listening, too. Another way to avoid monopolizers is to seed the discussion with speakers ahead of time. As students prepare for a few minutes in pairs or small groups, walk the room. Listen in. When you hear something you like, ask the student to share their idea during the later discussion. That provides practice time—and your pre-approval. Uptake is a response that builds on a prior answer rather than evaluating it or moving to the next question. Simply ask (or type for online discussions): Who can add to that? Who has a different perspective or solution? Can you say more about that? Where did you see that in our reading? Who can connect this idea to the concept of x? Uptake is associated with higher achievement, to boot. How can you reduce the press of content coverage? Canvas provides wonderful opportunities to hold students accountable for readings, problems, and content, all of which can be investigated prior to class. Many of our colleagues have shared their progress in “flipping” classes in this way. After students engage with the content, they complete quizzes, voice-thread discussions, short think-papers, online journals, or problem sets. This frees up time in class for more engagement in working more deeply through the material. After a chunk of content (15 minutes or so), add two slides. On the first one, pose a meaningful question (with multiple possible responses) about the content so far. For 1 full minute, students think and jot down some thoughts. For 2 minutes, they pair share their ideas. For 7 minutes, they share their ideas with the class. Use your second slide (in design mode) to record some of their thoughts. Use uptake to raise the bar when necessary by asking for terminology, connections to concepts, other perspectives, evidence. Project the slide again and resume your talk (if needed), stopping again in 10-15 minutes. So…I have a 32-student class in BT 1302 this semester, and I have yet to find a way to make a circle. But half the class can turn in their chairs to face the other half—that’s 50% more faces and voices heard. I can sit among students during these activities, decreasing the chance that they’ll turn to me for approval with every answer. Last week I grabbed a ruler from my office and created a “talking stick”—students signaled each other and handed off the talking stick for turn-taking. More students participated when they were in charge. Then I took back the stick for a bit to connect a few of the ideas to specific course concepts. Technology also helps get past furniture design. You can use Padlet to make various voices visible relatively quickly. Try the Chat feature in Canvas during student research presentations; peers write in with questions about the content, and more students stay engaged. Bonus: presenters then use the chat comments as feedback for their papers. Many of us have found VoiceThread to be a great way to develop multiple perspectives on key excerpts, images, or peer review. The good news is that discussion gets easier over time. Once students put their toes in the water, they’re more likely to step in (so long as it’s warm enough). Keeping them in the pool is easier than the first plunge. And with less IRE.